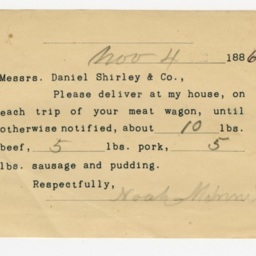 Order for meat from Daniel Shirley & Company of New Market Virginia. Dated November 4, 1886 and signed by Noah M____. Request slips for delivery via meat wagon, Box 2, Garber Shenandoah County Collection, Truban Archives, Shenandoah County Library, Edinburg, Virginia. 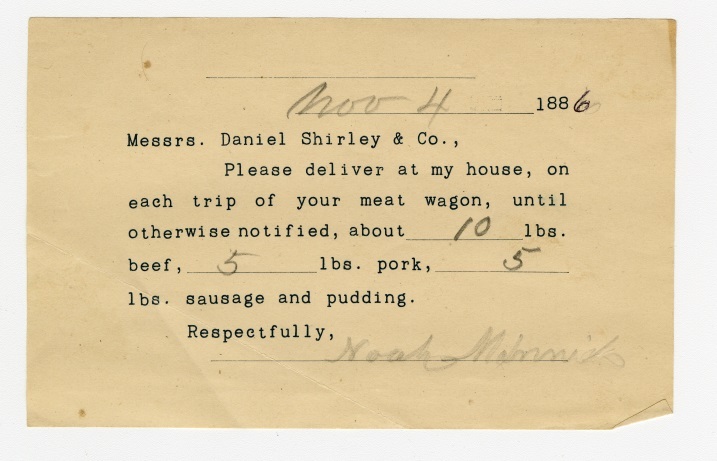 Daniel Shirley & Co., “Daniel Shirley & Company Meat Wagon Order from Noah M____,” Shenandoah County Library Archives, accessed April 25, 2019, http://archives.countylib.org/items/show/11720.